We’re all for putting a GPS where it doesn’t normally go, but we’re not sure [Roberto’s] version* is the best of locations. Take for example [Jair2k4’s] GPS. It doesn’t block out 50% of his vision of the road and the impending accident in front of him. Regardless, the solid aluminum and seamless mounting really does make it look like part of the car, and props to him for making it ‘hidden’ when he’s out of the car to try and prevent thieves. But there are cheaper, easier, and dare we say better solutions out there. *We found his site only works in Internet Explorer, gah! Really pretty and nicely hewn-in design. really great finish. I’m not sure I would put GPS/Nav there but it’s a great idea for a starting point — how about diagnostic info from the car, so you don’t need to always keep an eye on it but you can flip it down if it starts running funny or you think it’s on the way to overheating? Great design principles followed here and look at how stunning the outcome is! on a scale of 0-10, with 10 as the most difficult, where would you place it? A better solution is to look down at the handbrake all the time? 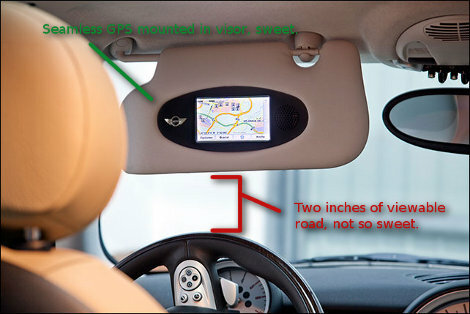 A better solution is to use the stock windscreen mount. He says “Completely integrated in the original sunvisor” so if that’s the stock visor as supplied by BMW, I’d guess that the 2 inches of visibility is a trick of the eye. Maybe he needs to take a photo from another angle, the drivers seat maybe. Wow that is a 99% good idea, maybe chop away any excess visor that isn’t screen and you have yourself a deal. Heads Up Display is the way forward. The site appears to work fine in WebKit browsers (safari, for example). Also, I don’t see the fuss about view obstruction. If it’s the original visor, then maybe we need to get mad at the sun for blocking our view of the road? Basically, I’m saying that I think this is really cool. The only critique is that, yes, we know it’s a mini. We don’t need the badge and the boot-screen, that’s just too many logos. Don’t forget that constant changes of eye focus from visor to the road will put additional strain on the eye muscles. It’s better when the GPS is mounted farther away, as the eyes don’t need to adjust focus that much. If you’re going to write your own web page, don’t choose ultra-picky XHTML and then fail to validate it (or use non-standard Internet Explorer). Visor is as low as the rear view mirror. Nice job. Normally you’ll fold those visors out some toward the front, effectively lifting the bottom edge up. Jeez guys. He should have made it flop down and swing out with gravity, hinged at the top, to compensate and allow the visor to be opened all the way forward properly if viewing is an issue. Or just hire a short chick to drive him around. Embed it in the Rear view mirror. Oh wait those are already available. The site works fine in Safari. I have a Sprinter van this would work well in. I keep the visor down 24/7 anyhow as the windshield is so large. Solid aluminum enclosure in visor, folded back when you know where you’re going.. + car crash = de-brain-ify? Put it in a pillow enclosure with an flexible AMOLED, and I’d be less scared. Nice build. As a quick flip down device to read while stopped, neat. A HUD would be even neater, but is obviously a considerable design challenge. Anyone who’s taken the time to read their car’s manual would know that the visor is intended to be rotated flat against the windshield when in use… and yes, I do usually deploy it with the blade edge aimed at the bridge of my nose. Do you notice the angle the picture is taken from? 90% (made up number) of people who have car GPS systems don’t even need them. At least not enough to require a dedicated car mount. You’re not going to get lost driving from home to work or going to the grocery store. A page that doesn’t work in Firefox? I didn’t realize such a thing still existed. paradoxical, you can’t see where you are going but you know where you are going…. No one has said it, but what about some pr0nz on the way home from work? Uncertainty Principle on the macro scale??? FireFox (Namoroka 3.6.3 on Arch Linux) shows the copyright and a blue background, that’s it. @*We found his site only works in Internet Explorer, gah! The apparent two inches of road view is due to the angle of the lens, dumbass. The closer you are to the visor, the more you’ll see through those “two inches”. Back here in Europe the roads are generally only below the horizon. I Have yet to see a floating road or car that is crucial to notice during driving.